These showy, native wildflowers appear from April to June in sunny or partially sunny locations. They grow from 3 to 5 ft. tall in brilliant masses; this group was photographed along the side of the road at Primland in Meadows of Dan. The two-lipped, tubular flowers are borne on a panicle at the top of the plant; each flower is a bit larger than 1 inch long. The stem leaves are opposite, and lance-shaped to oblong. The leaves and stem of foxglove beardtongue are hairless. 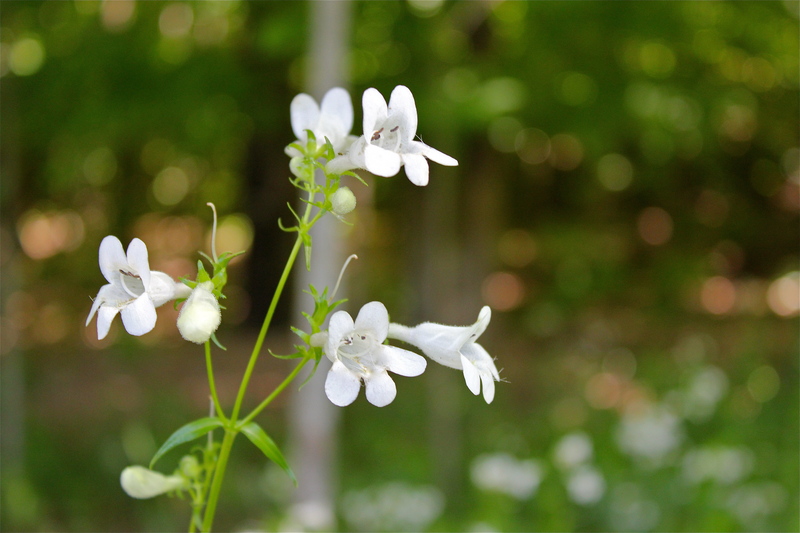 The name beardtongue comes from a prominent stamen at the mouth of the flower: it is hairy! The other common name, foxglove penstemon, comes from the fact that the flower shape resembles foxglove (Digitalis). The tubular flowers are visited frequently by all kinds of bees. For contrast, check out Eastern Smooth Beardtongue here. I really appreciate how you take pictures of the wildflower and it’s foliage from many different angles. This is so helpful!